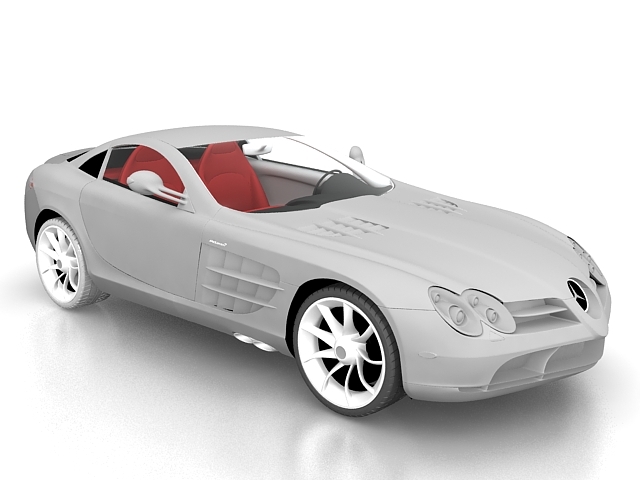 Mercedes-Benz SLR McLaren grand tourer car 3D model for 3d max, 2-door coupe, 5-speed automatic, front mid-engine, rear-wheel-drive layout. Mercedes-Benz SLR McLaren is a grand tourer car jointly developed by Mercedes-Benz and McLaren Automotive, built in Portsmouth and the McLaren Technology Centre in Woking, Surrey, England and sold from 2003 to 2010. When it was developed, German manufacturer Mercedes-Benz owned 40 percent of the McLaren Group. Free download this 3d object and put it into your scene, use it for 3d visualization project, present of concept cars, product designs, rendering of virtual environment, computer games, 3D modeling and animation, etc.